The term "plastics thermocouple" refers to a style of thermocouple designed and used by the plastics, packaging and rubber industries. They are installed on injection molding, thermoforming, vacuum forming, and extruding equipment to accurately sense the temperature of the plastic molds and nozzles. While there are a variety of configurations of plastics thermocouples - such as bayonet, washer style, shim style, nozzle, and right angle - their basic components remains the same. In most cases, plastics thermocouples are ANSI type J or type K calibration. Type J or K lead wire is available in a variety of insulation materials and protection options, such as high temperature fiberglass, PVC, stainless steel braided fiberglass, or stainless steel flexible armor cable. Electrical connections are most commonly bare leads, male thermocouple jacks, female thermocouple plugs, or spade lugs. Bayonet designs are straight or right angle, and use industry standard bayonet fittings that easily retrofit most injection molding and plastics processing equipment. These fittings allow for adjustable depth and are spring loaded for maintaining goos contact with the media. 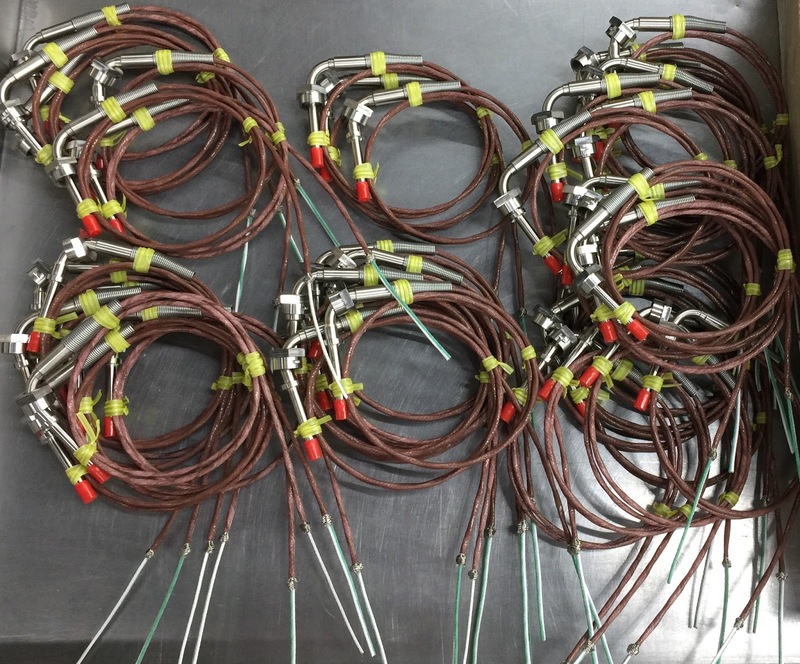 Washer and shim style thermocouples weld or crimp the thermocouple sensing junction right to the washer or shim. 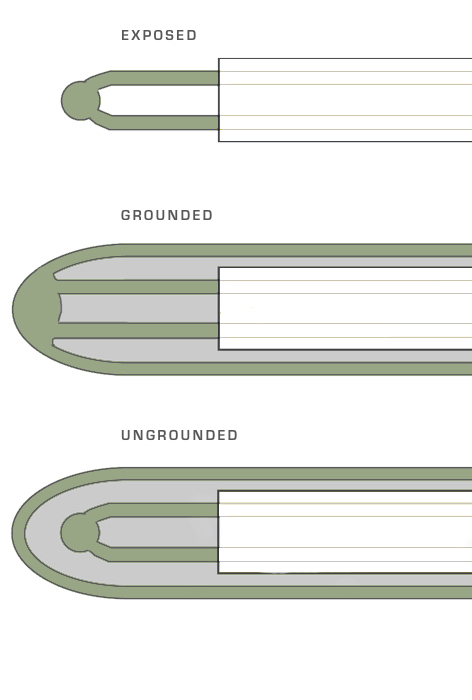 Bayonet thermocouples use a tube and wire design utilizing stranded thermocouple cable through out the probe. The metallic probe is made of 301, 304 or 316 series stainless steel. 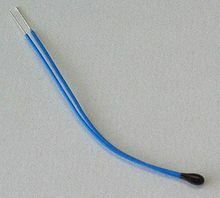 The thermocouple can made with a grounded, or ungrounded junction. A grounded junction is welded to the tip of the probe and, while it has very fast response, it can conduct electrical noise back to the instrumentation. 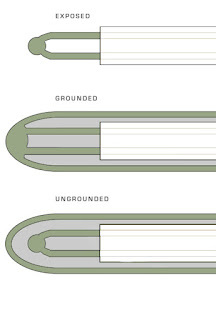 An ungrounded junction is isolated from the metallic probe, and prevents electrical noise transmission. However, ungrounded junctions are slightly slower to respond to temperature changes. For more information on plastics thermocouples, contact Duro-Sense by visiting https://duro-sense or by calling 310-533-6877.
vibration, and widely-changing ambient environments. All products are calibrated to NIST standards and are ISO9001, AS9100, ISO17025 compliant. All temperature sensors are designed and tested to provide exceptional accuracy, stability and reliability in the most demanding environments. Call 310-533-6877 of visit https://duro-sense.com for more information. This post explains the basic operation of the three most common temperature sensing elements - thermocouples, RTD's and thermistors. A thermocouple is a temperature sensor that produces a micro-voltage from a phenomena called the Seebeck Effect. In simple terms, when the junction of two different (dissimilar) metals varies in temperature from a second junction (called the reference junction), a voltage is produced. When the reference junction temperature is known and maintained, the voltage produced by the sensing junction can be measured and directly applied to the change in the sensing junctions' temperature. 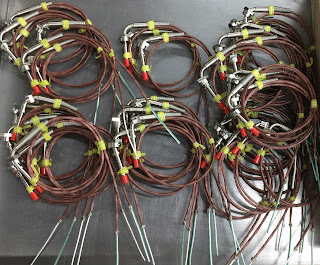 Thermocouples are widely used for industrial and commercial temperate control because they are inexpensive, fairly accurate, have a fairly linear temperature-to-signal output curve, come in many “types” (different metal alloys) for many different temperature ranges, and are easily interchangeable. 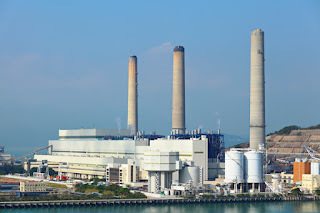 They require no external power to work and can be used in continuous temperature measurement applications from -185 Deg. Celsius (Type T) up to 1700 Deg. Celsius (Type B). 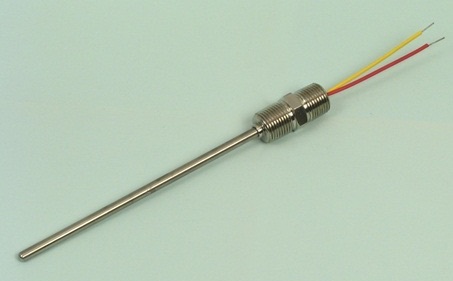 Common application for thermocouples are industrial processes, the plastics industry, kilns, boilers, steel making, power generation, gas turbine exhaust and diesel engines, They also have many consumer uses such as temperature sensors in thermostats and flame sensors, and for consumer cooking and heating equipment. RTD’s (resistance temperature detectors), are temperature sensors that measure a change in resistance as the temperature of the RTD changes. They are normally designed as a fine wire coiled around a bobbin (made of glass or ceramic), and inserted into a protective sheath. The can also be manufactured as a thin-film element with the pure metal deposited on a ceramic base much like a circuit on a circuit board. The RTD wire is usually a pure metal such as platinum, nickel or copper because these metals have a predictable change in resistance as the temperature changes. RTD’s offer considerably higher accuracy and repeatability than thermocouples and can be used up to 600 Deg. Celsius. They are most often used in biomedical applications, semiconductor processing and industrial applications where accuracy is important. 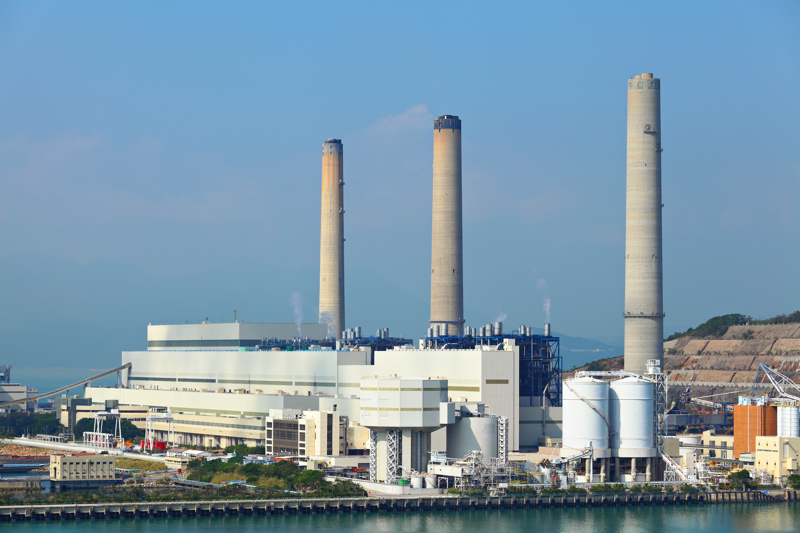 Because they are made of pure metals, they tend to more costly than thermocouples. RTD’s do need to be supplied an excitation voltage from the control circuitry as well. The third most common temperature sensor is the thermistor. Thermistors work similarly to RTD’s in that they are a resistance measuring device, but instead of using pure metal, thermistors use a very inexpensive polymer or ceramic material as the element. The practical application difference between thermistors and RTD’s is the resistance curve of thermistors is very non-linear, making them useful only over a narrow temperature range. Thermistors however are very inexpensive and have a very fast response. They also come in two varieties, positive temperature coefficient (PTC - resistance increases with increasing temperature), and negative temperature coefficient (NTC - resistance decreases with increasing temperature). Thermistors are used widely in monitoring temperature of circuit boards, digital thermostats, food processing, and consumer appliances. 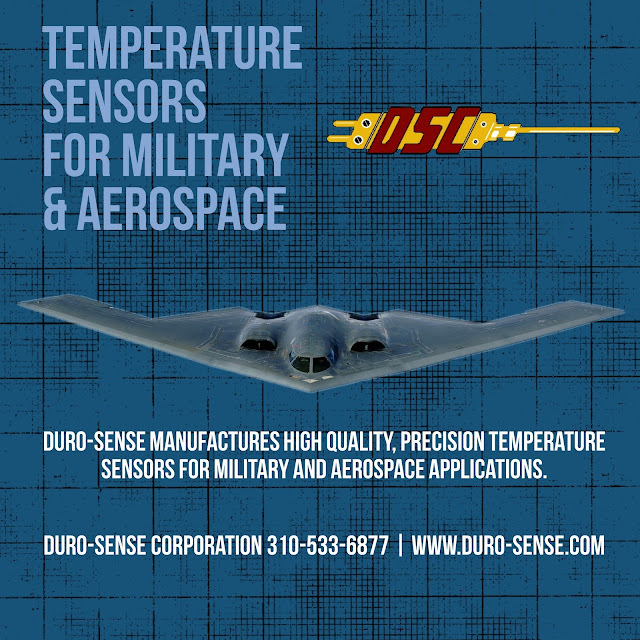 For more information, contact Duro-Sense by calling 310-533-6877 or visit https://duro-sense.com. What is the Difference Between Thermocouple Wire and Thermocouple Extension Wire? Insulated thermocouple wire is single pair wire that can be made into a thermocouple. More specifically, it is the wire from the sensing junction, to the point of cold junction compensation. Thermocouple wire is made from two dissimilar metals conductors that are joined (welded) together at the sensing end. Different metal wires are used for the various types of thermocouple types (J, K, T, E, etc). These dissimilar metals produce a millivolt electrical signal at the cold junction that is proportional to the change in temperature at the sensing end. Thermocouple wire has two grades; standard and Special Limits of Error (SLE). Special Limits of Error wire is made of the same metals as standard wire, but uses a higher grade with increased accuracy and higher expense than standard thermocouple wire. 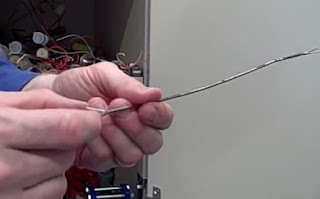 Thermocouple wire is almost always insulated. Insulation varies from low temp (Nylon, FEP Teflon, TFE Teflon, PFA Teflon, Kapton) to high temp (fiberglass, Hi-Temp fiberglass, Refrasil, Ceramic Fiber). 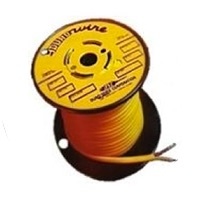 Thermocouple wire is typically sold in 1000' spools, but can be sold in small quantities as well. Thermocouple extension wire is a single pair wire that cannot be made into a thermocouple, but is used to carry the signal from a thermocouple to the recorder, controller, or instrument reading the signal. Extension grade wire is used to carry a signal representing the higher temperature seen by the sensing location, but extension wire itself cannot be generally exposed to those higher temperatures. Extension wire cannot be used to make a thermocouple, but thermocouple wire can be used as extension wire. Insulation is typically PVC, but other option are available. Multi-pair extension wire is simply more than a single pair in the same jacket. It is extension only and is usually available in 2,4,6,8,12,16,24 pairs. It is used primarily when a contractor has to run multiple runs of wire. It allows them to run one piece of wire rather than multiple individual runs. For more information on all varieties of thermocouple wire, contact Duro-Sense by calling 310-533-6877 or visiting https://duro-sense.com.